The annual Bald Eagle Watch will be held on Saturday, March 2 at the Prairie Heritage Center. 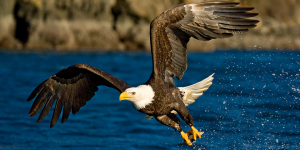 This event is a come-and-go opportunity to observe eagles throughout the day. The O’Brien County Naturalist and other volunteers will be on hand to help you spot and identify eagles. At 2:00 p.m., Iowa author/photographer, Ty Smedes, will be presenting information about raptors. Smedes photography and knowledge of birds makes this a presentation you won’t want to miss! There will also be hands on learning activities for people of all ages available throughout the day. Bring the family for an enjoyable day of viewing eagles and learning more about them! Stop by the Prairie Heritage Center throughout the day from 9:30 a.m. until 4:00 p.m.